To register for a tour please complete the following pre-registration booking form for each traveller. A tour consultant will acknowledge your request with a confirmation within 2 business days. Do you wish to purchase insurance? Reservations: Please book early. To reserve space, contact Ottawa Valley Tours or your local travel agent. Some travel agencies may charge a service fee. You may preregister online at ottawavalleytours.com. Deposit and Payment: A deposit of $100.00 per person plus optional Cancellation/Interruption Insurance is required within seven days of making your reservation for a MultiDay Tour. If the deposit is not received within this time period, reservations are automatically cancelled. Final payment is due 60 days prior to departure for Multi-Day Tours on the Early Booking Bonus Program. Full payment is required at time of booking for One Day Tours. A $950.00 deposit on Air/No Fly Cruise Vacations is required at the time of reservation. Final Payment is required 130 days prior to departure for Air/No Fly Cruise Vacations. Full payment is required on all tours at the time of making a reservation if made within 60 days of departure. Rates: All rates are based on current exchange rates, current tax rates, and fuel costs at time of printing and subject to price increases if not paid in full. Rates in this brochure are in effect until November 1, 2019 (excluding “No Fly” cruises). Some offers are promotional and are not necessarily repeated in future brochures. Transportation Credit: For out-of-town passengers travelling a minimum of 75 kms to join a Multi-day Tour, Ottawa Valley Tours will allow a $25.00 per person Transportation Credit to the closest point of departure. Method of Payment: Cash, Cheque, Visa and MasterCard. Baggage: Maximum baggage allowance, per person, is one large suitcase plus a carry-on. Tipping: Tipping has been an accepted custom wherever one travels. Tipping has been prepaid for any included meals and for the bellman handling one piece of luggage per passenger by Ottawa Valley Tours. Any additional tipping for local step-on- guides, your motorcoach driver and tour director should be extended on an individual basis at your discretion. Shipboard gratuities and other items of a personal nature are not included on No Fly Cruise Vacation Tours. Identification for Tours to the United States: All Canadian and Non Canadian persons require a valid passport for travel. Some countries require six months remaining validity on passports. NonCanadian citizens and Landed Immigrants should confirm with the appropriate foreign consulate for any additional entry requirements. A Permanent Resident* Card will replace the paper IMM 1000 Record of Landing as required proof of status for permanent residents of Canada – including children to re-enter back into Canada. *A permanent resident is someone who has been allowed to enter Canada as an immigrant, but who has not become a Canadian citizen. Passports, Visas, Permanent Resident Cards and sufficient proof of identification are the responsibility of the passenger. Air and No Fly Cruise Vacations: Non Refundable 0-130 days prior to departure. Over 131 days - $300.00 administration fee per person is applicable. Returned Cheque Policy: A $50.00 fee will be charged for non-sufficient funds on returned cheques. Name Changes: A $75.00 Name Change Fee will be applicable if made within 14 days of departure. Name changes are not permitted on Air or No Fly Cruise Vacations. Child Discount: Children, 12 years and under, will receive a discount of 10% off the twin rate, sharing with a full fare paying adult for the multiday tours. Excludes Air/No Fly Cruise Vacations and One Day Tours. Children, five years of age and under, are not eligible for coach tours. Travel Insurance: Emergency Medical and Cancellation/Interruption Insurance is strongly recommended and is available through our office. Please make sure you are covered before leaving the country. Cancellation/Interruption Insurance must be purchased at time of deposit. You should not leave home without coverage. Tour Director: Each tour is accompanied by one of our caring professional tour directors, unless booking on one of our Independent Holidays or Air Vacations. Seating: In all fairness to early booking passengers, seats will be assigned according to the date and payment of your reservation. Passenger Conduct: Ottawa Valley Tours, or any of its representatives, reserves the right to terminate any passenger, at any time during the tour, whose inappropriate actions or behaviour are considered detrimental to the interest, comfort and enjoyment of the other tour members. Smoking or alcohol is not permitted on the coach. There will be no refund for the unused portion of the tour package or post termination costs. Special Needs and Assistance Requirements: Please notify the reservation agent of any physical condition, special requirements or needs at time of booking. Passengers must ensure they are medically, mentally and physically fit for travel. Passengers requiring special needs or assistance as described, must be accompanied by a travelling companion, who will accept full responsibility for safety, care and control. Requests: Ottawa Valley Tours will do their utmost to ensure that the request is relayed to the appropriate parties, but will not accept responsibility if not fulfilled by our suppliers. Ottawa Valley Tours does not refund any unused portions of your tour. Responsibility: Ottawa Valley Tours, owned and operated by Ontario Corporation #1395081, has made all the arrangements for the tour services described in this brochure and on our website, including but not limited to the transportation, meals, sightseeing, tickets, cruises and hotel accommodations. The carriers, hotels and suppliers providing tour services are independent contractors and are not agents, employees, servants or joint venturers of the company or its affiliates. 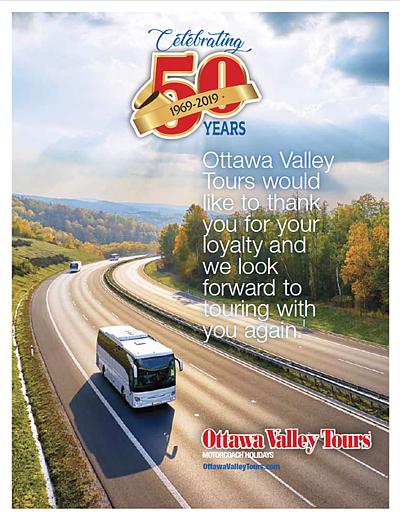 Subject to O.Reg 26/05, for any reason, the services in the tour cannot be supplied, or there are changes to the itinerary, Ottawa Valley Tours will arrange for the provision of comparable services. Subject to O.Reg 26/05, Ottawa Valley Tours reserves the right to reschedule, alter or cancel a tour at its discretion should it become necessary. Ottawa Valley Tours, nor its affiliates, nor their employees or agents, shall be liable whatsoever for any act, omission, damage, injury, loss or death as a result of terrorism, acts of God, catastrophe, force majeure and factors beyond our direct control or the fault of its suppliers and Ottawa Valley Tours is hereby indemnified by the customer against any damages resulting from any and all such matters. A deposit given on any tour represents the customer acceptance of all the aforementioned Terms and Conditions. Ottawa Valley Tours has always recognized the importance of your right to privacy and we will continue our commitment to safeguarding your personal information as set out by the Personal Information Protection and Electronic Documents Act and its ten principles.